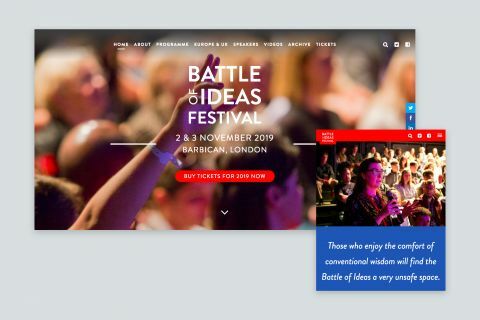 The Battle of Ideas festival, hosted by the Barbican, London, is an annual event bursting with lively debates and inspirational talks. The weekend hosts over 90 sessions led by speakers from all around the globe, offering an abundance of perspectives and insights. Such a generous line-up means a lot of information to organise and present, so when creating the new website it was important to incorporate features for optimum accessibility. For instance, visitors can filter the programme in various ways, from specific day, strand, or theme. 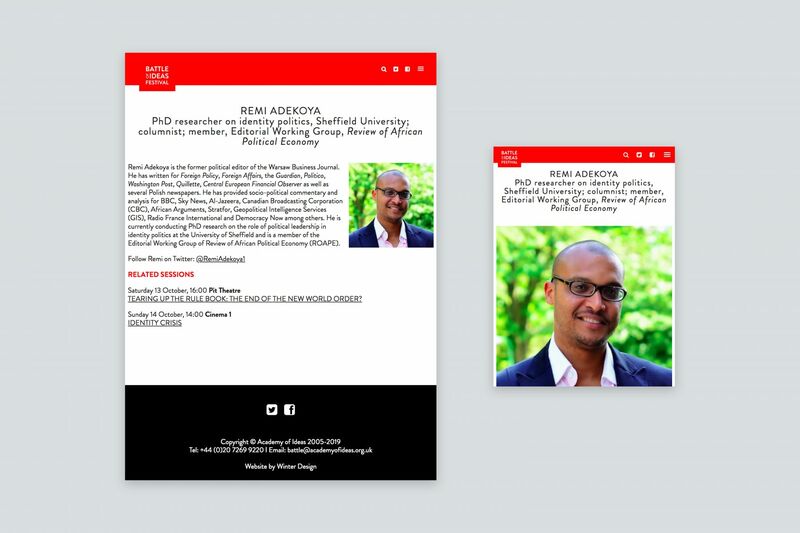 Isotope animation enhances the browsing experience further, and a three-column layout keeps information easily digestible and consistently presented. 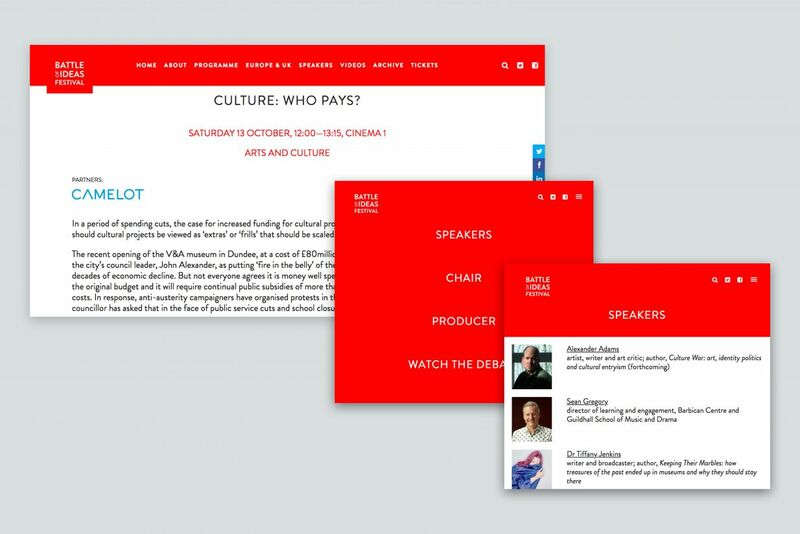 Each programme session has its own page for all of the detail. Cornerstone content, accessed via a striking collapsible menu, presents key details whilst maintaining a layout which feels clean and considered. Embedded links are also included for relevant further readings, to involve, inspire and engage visitors. 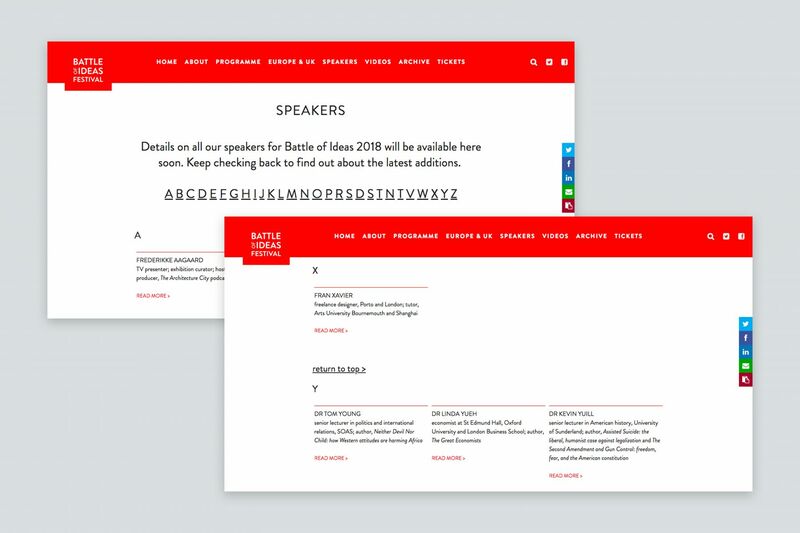 Exploring the list of speakers is made simple by alphabetical organisation, with alphabetical filter links. Each speaker has a detail page including a short biography, social media links and navigation to their related sessions. The site embraces numerous media platforms, to give a real taste for what’s in store. 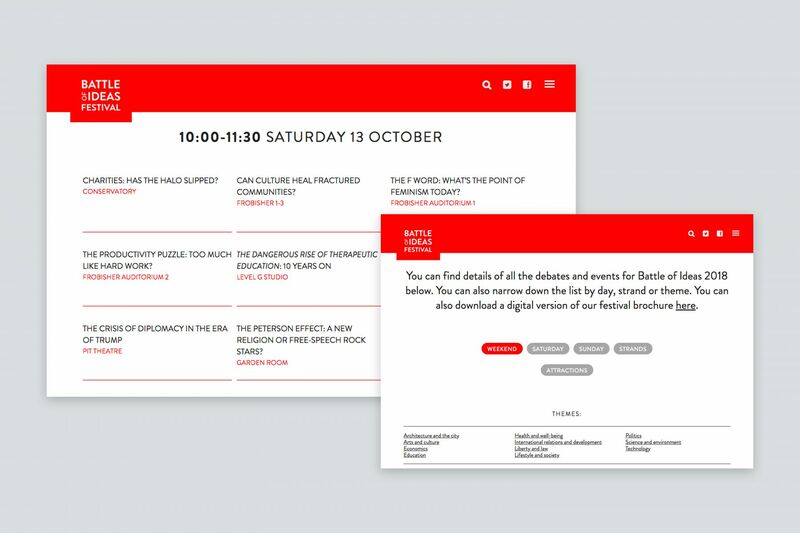 The festival brochure is offered as a digital download from the programme overview page, and full-length videos of talks are laid out in a grid format, alongside links for audio options. The calls to action on the homepage are a great way to increase sales and newsletter signups. 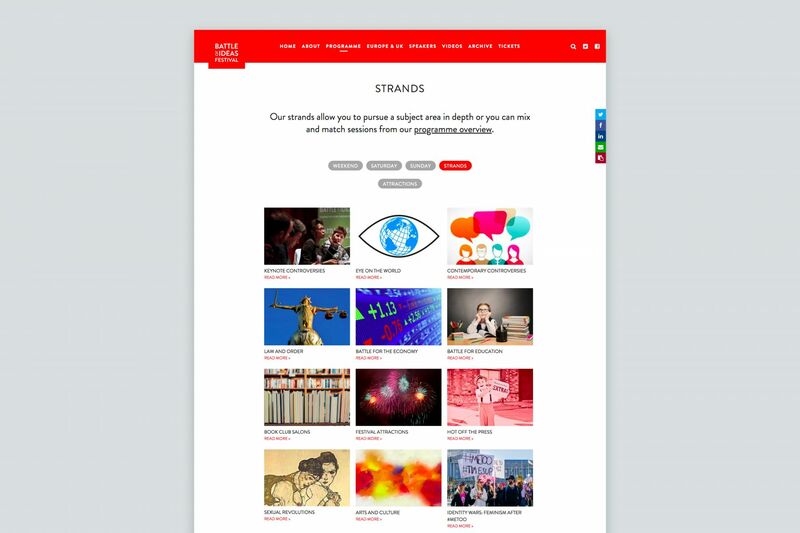 They are punctuated with quality copy, a programme snapshot, stunning imagery and a fixed navigation bar. 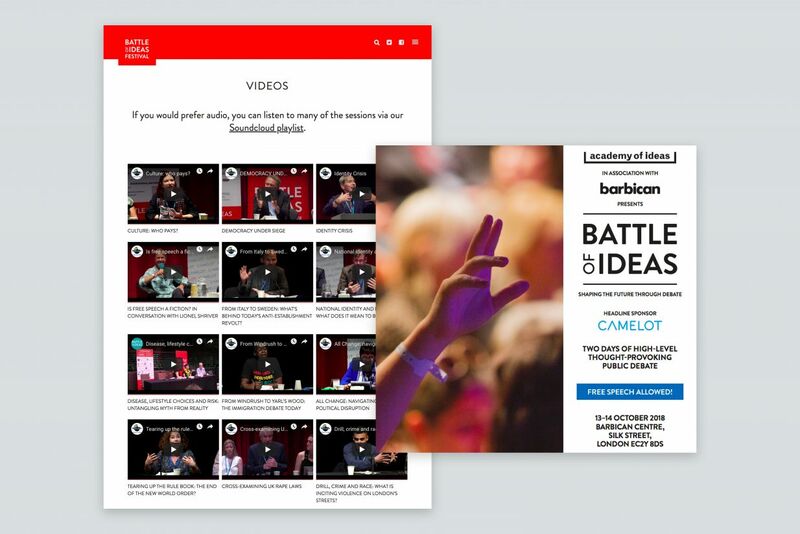 This provides visitors with an instant overview of the event and encourages further reading. The site is all wrapped up with a striking colour palette, fluid responsive layout, and HD friendly images, as always. 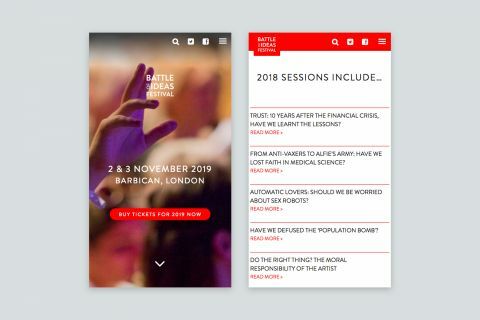 Experience it yourself, at battleofideas.org.uk.